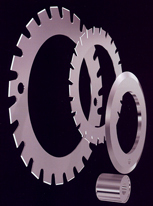 The Mid-Atlantic Knife Company carries an extensive stock of both slitters and perforators for most makes of folding machines. Not only do we carry the standard knives that are available from the OEM, but we have worked closely with our customers to manufacture knives designed especially for slitting and perfing book work, coated stock, and card stock. If you have a particular folding job that needs a special knife, please feel free to call us. We will be happy to help design a blade that will solve your folding problems. All stock orders are shipped within 24 hours or sooner. All special manufactured knives are delivered in four weeks or sooner.